The Long Beach Unified School District continues to partner with the nonprofit Harmony Project, which helps to provide classical music education for children from lower-income communities. A reception and fundraiser for the project hosted by the school district and the Long Beach Education Foundation is scheduled for 5:30 to 7:30 p.m. Wednesday, Dec. 14 at the Terrace Theater Lobby, 300 E. Ocean Blvd., Long Beach. RSVP at harmonyproject@lbschools.net, or call 997-8448. Founded in 2001 in Los Angeles, the Harmony Project has been recognized twice by the White House. Measurable results from the Harmony Project, collected through studies done in partnership with Northwestern University, have shown that the program works to keep students on track to graduation and makes them better learners. 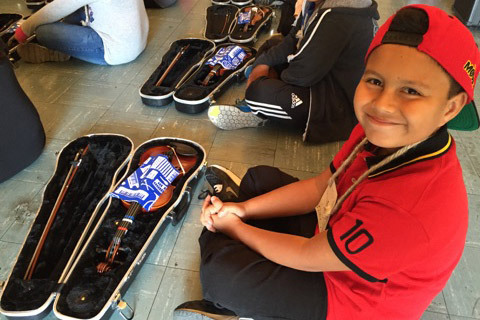 HARMONY PROJECT – Harte Elementary School student Julian Herrera receives a new violin as part of the nonprofit Harmony Project, which helps to provide classical music education to children in high-need communities. LBUSD has partnered with the organization to supplement a comprehensive music education curriculum.